With everyone digging deeper into their moth eaten pockets full of fluff, are the offers of cheap web design worth their weight? 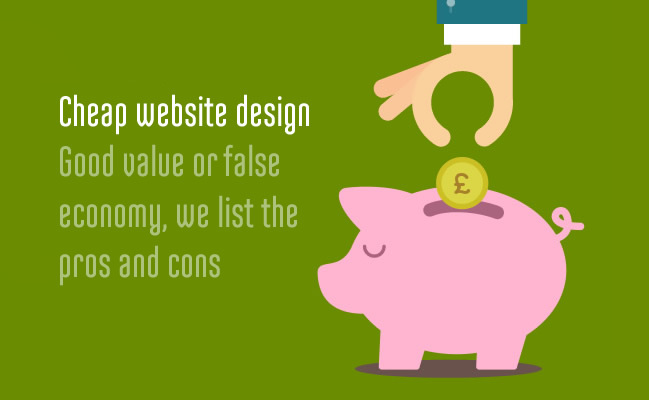 We firmly believe in spending as much as you can on your website. You want to fill your customers with the confidence to buy from you, or portray a professional image that reflects how it will be to deal with you in business. That said, not everyone has a big enough budget to fulfil every whim and desire. You can pay for cheap website design but it is unlikely that it will be worth the money – a professional designer will follow a process to ensure that your website works across many browsers and screen sizes, offers excellent security features and the option of a custom design. The many years experience that we offer will mean that you will get a high standard of website design that you are very happy with! Buy cheap – pay twice is the old addage and never more so than with one of the most important aspects of your business. We cater for all budgets and have some great solutions for all. With bespoke design that includes branding that can be integrated very professionally across your website – swirls and backgrounds that move smoothly as visitors scroll, e-commerce that is set up perfectly to operate on SSL certificate ensures you give the right impression. We hear from all kinds of businesses and traders, from hairdressers to gyms, double glazing to office furniture – we also get to hear about clients who have made mistakes and the horror stories. You can buy cheap design, cheap websites and cheap logos – but they are just that, cheap and with aspects of your business that rate highly in importance, it is worth you paying a fair price for better quality and a professional service.